While this won’t be nearly as exciting as our leaked Dell Streak 7, G-Slate, and Vibrant 4G release dates from earlier this afternoon, new color options are always exciting (well, maybe not for this device). 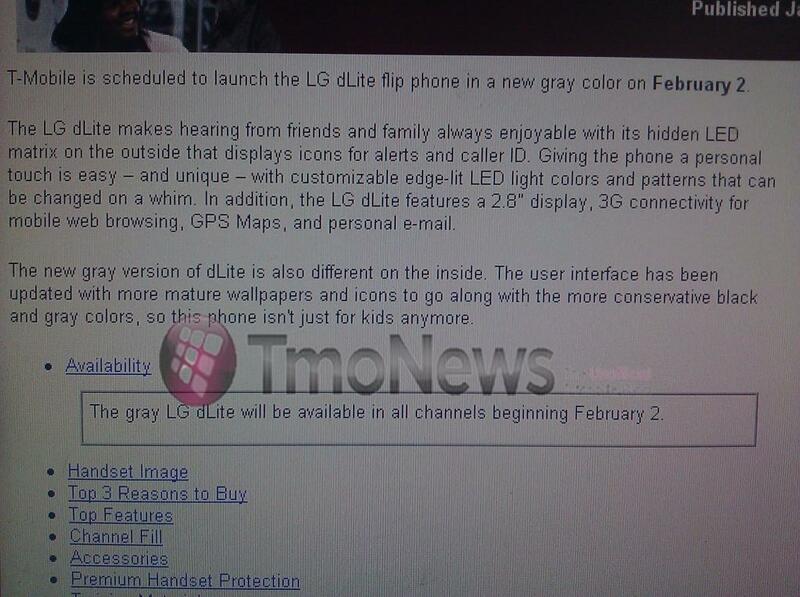 Beginning February 2nd, T-Mobile will be launching the LG dLite in a new gray color. The new color option will be available through all channels. So who’s getting one? Anyone? Not now or ever will I buy that phone. That looks like a great phone for 2007.
meh.. still waiting for a Cortex-A9 dual-core, Android 2.3 phone, with a 4″ SAMOLED+ screen.. i’m using a G2 with a custom rom now. The LG DLite was rated one of the top 5 cell phones (not smartphones) by CNET. So again, more variety will not hurt TMobile. Especially since all carriers are pushing their data plan rates up toward $30 or more per month. It’s funny, I am paying $59.99 for 750 minutes on a family plan, and starting next month $60 dollars for just a data plan for two phones. What is going on? Yes they are making smartphones more affordable, however they are catching you on the back end with increasing the price on data plans. The LG dLite is the best feature phone we offer. The grey will be a big help for men. If only LG dlite was the same as it’s Korean brother. It would’ve been an awesome phone. Despite it being a feature phone. Another LG phone keeps hope alive for the Optimus 2X coming to T-Mobile. This phone was made for the teen/pre-teen girls out there. That’s why it’s only 50 bucks. So if you want your pre-teen to have a cell, then it’s good for them. As for guys, even if it’s in hot rod red they still wouldn’t want it. ive had a TON of phones from tmobile….by far, the best ive ever owned was the motorola razr (pink when i was a teenager! )….when my contract was up, i liked the dLite, but i was not walking around with a giant, awkward pink/babyblue phone…now that it is in gray, i am considering paying retail price for it….i loved all the features it comes with, so i cant wait for it to come out! I’VE BEEN WAITING FOR THIS ALL MY LIFE! I actually just ordered mine becuz I’m getting the streak as my main web device. As a tmo dealer, we are seeing more customers do this same thing, and the dlite is a nice phone to have as just a phone. I hope they overhauled the GUI on that puppy, because if it’s still pink and frilly J-Pop on the inside, T-Mobile just made a ridiculously horrible mistake. The new grey is aimed at men, so the inside themes are more manly, not at all like the pink/blue. We got our demo in a couple days ago and its really nice.